passive income for years to come…. …and Have a Lot of Fun Doing It! I want to help you write your own children’s book in less than 48 hours and sell lots of copies on Amazon! I’ve authored more than a dozen #1 Amazon bestselling children’s books and earned over $10,000 in a single month from royalties (while also generating a hefty ongoing passive income stream because Kindle royalties can be as much as 70%). There’s no better time than now to get started publishing your children’s books on Amazon. The children's ebook market is up 475% this year alone, which makes it one of the fastest-growing book sectors on Amazon. Plus, once you know my system, children’s books are also one of the easiest types of books to write and market. The core of my system is our step-by-step video training which covers every aspect of Kindle publishing… from nailing down your book’s topic, through writing it quickly to making the most of Amazon’s system to sell your book on autopilot. To make it super-easy for you to implement and follow, I’ve broken it down into individual modules which are released to you weekly. Is this your first children’s book? Are you wondering how to come up with a story that’s guaranteed to “hook” your young readers -- and have them coming back for more? This ingenious brainstorming tool will allow you to mix & match the “secret ingredients” of a successful children's book, and put them together in a unique way that kids & parents will find irresistible. Just select a character, theme, setting, and format... add your own “secret sauce”...and you’ll have the makings of your own best-selling children’s book. The “Idea Wizard” makes it that easy! These are the very same templates that Jay uses to write & publish all of his Kindle children’s books, and they will help you to streamline the process of publishing your first children’s book (or any book!) so you can work fast & stay organized! Are you “tech challenged?” Well there’s no need to worry about digital formatting headaches with this handy piece of software, which will instantly convert your children’s book manuscript into a Kindle-ready .html file with the push of a button. Jay payed his developers over $3000 to create this powerful ebook formatting tool, and you’ll have unlimited access to it with your investment in Children’s Book System. If you get stuck at any point along the way, don’t worry. Because you’ll be able to log into these live webinar coaching sessions and get all of your questions answered live 1-on-1 by me and my team! You’ll also be able to send your children’s book to me on these live trainings, who will personally review your Amazon listing page and tell you how to optimize your title, cover, pricing, description -- so you can sell more books! I typically charge $500 per hour for a private coaching call, so this bonus is an incredible opportunity for you. You may not be ready for these advanced book marketing strategies if you’re just starting out as a first-time children’s book author, but this training will be there for you when you need it! You’ll discover how to “scale up” after you publish your first children’s book, and turn your hobby into a full-time income! You’ll also discover how reach out and connect with even more kids & parents with your children’s books, leverage talented outsourcers, and assemble a team to help you grow your book business quickly and easily. Do you know the #1 best way to turn your Amazon children’s book buyers into raving fans & subscribers (that you can’t wait to purchase your next book)? It’s easy...by simply pulling those folks out of Amazon and adding them to your email list...and this bonus training will show you how! You’ll then be able to build a lasting relationship with your book buyers, send additional value to them, send your next children’s book to a #1 bestselling status within 48 hours after you publish it. So what does my Children’s Book System cost? As you can see above, the total value of my system is at least $2,832.00 and as mentioned earlier, I’ve generated over $10,000 in royalties from my children’s books in a single month. Now I’m certainly not promising you can do the same (or make any money at all). After all, I don’t know you. But you can clearly see that my system works. Because even a modestly successful children’s book can generate thousands of dollars in royalties over time, many people have told me I should charge at least $1,500 for this information. However, I want to make it available to as many authors as possible, so you may now have access to the entire system for just $397. Click here to enroll in the Children’s Book System and let’s get started! 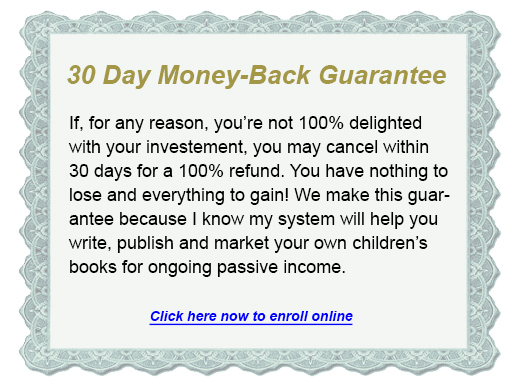 You have nothing to lose because the program comes with a complete 30-day money back guarantee.